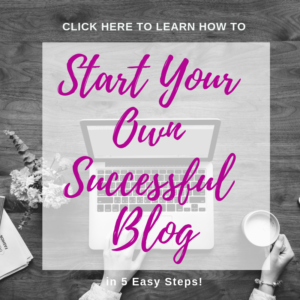 The journey that has come along with this blog for me is incredible. I used to consider myself someone who did not know how to cook and I had no idea how to make things healthy that I loved. What amazes me so much is how my ability to cook and experiment in the kitchen has changed in the past 4 months. 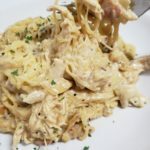 I was scrolling through Delish recipes looking for one my mother in law tagged me in and I found Chicken Caesar pasta. It looked super delicious and loaded with calories. I thought, I can make that lighter. 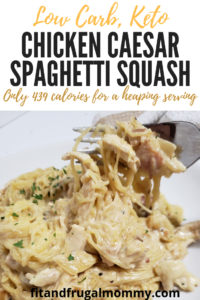 This Chicken Caesar Spaghetti Squash is soooo satisfying and I think is a testament to how far I have come. 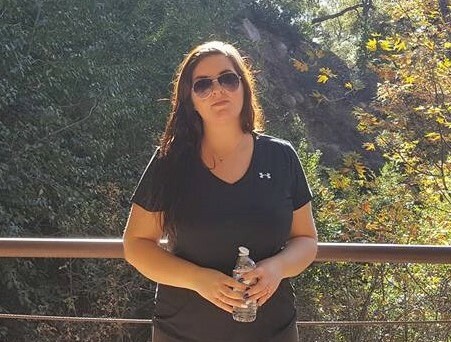 Before I got pregnant with my son, I despised the flavour of bacon. I was always the odd ball out because I couldn’t stand it. This recipe features bacon and I love it. My taste buds completely changed with him and I’m not even mad. Sprinkle bacon in everything! I am on board. In this recipe, I used the Kirkland Ready-Made bacon from Costco. 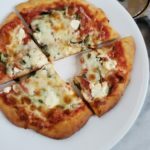 You don’t have to use ready-made, but as a mom short on time, I appreciate all the shortcuts! 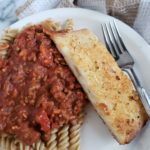 When I first created this recipe, I used corn starch to thicken the sauce. Corn starch is not considered keto compliant, and it can be swapped out for xanthan gum in a 1:1 ratio. 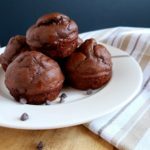 Xanthan gum is also a thickening agent, which is keto compliant. You can grab some xanthan gum from Fit and Frugal Mommy using this link. If you’re ok with just a low carb meal and aren’t keto, you can grab corn starch here. 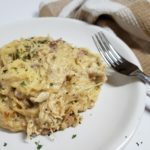 This recipe uses shredded chicken breast. I have included the instructions in the recipe below so you don’t have to flip between pages. For future reference, I also have this quick and easy guide: How to Boil and Shred Chicken Breasts. I use shredded chicken in a lot of recipes because it’s really easy to make and it retains a lot of the juiciness of the chicken. I typically cook 2 breasts at a time which will work out to about 2 cups and I keep it in the fridge for whatever I am feeling! Super easy meal prep (#winning). You also may notice this recipe uses Renee’s light caesar dressing and I have named the brand specifically. This is not an advertisement, I simply think that Renee’s caesar dressing is much better than any other counterparts I’ve tried. 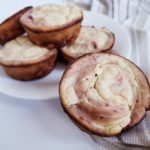 Have a favourite low carb, keto recipe in your family? Let me know in the comments below! 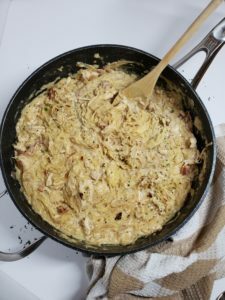 A low carb, low calorie chicken caesar 'pasta' dish that's soo creamy and cheesy, you'll think you're cheating. 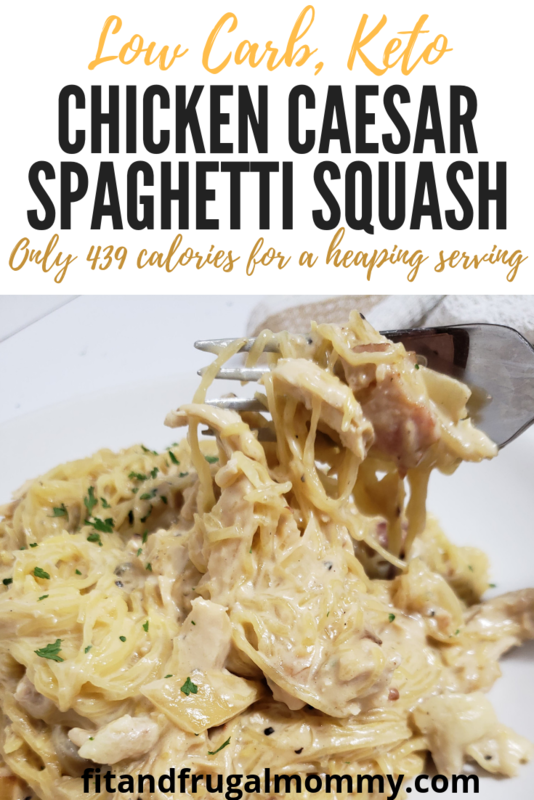 Cut the ends of the spaghetti squash and then cut the squash in half lengthwise. Scoop out the seeds and discard. Place the squash on a pan lined with wax paper cut side up. Drizzle the 2 halves with the extra virgin olive oil. Add salt and pepper to taste and cook for 45-50 minutes depending on the size of the squash. Remove the squash from the oven when it's done. Allow time for the squash to cool. Using a fork, peel the spaghetti away from the sides. If this isn't done easily, the squash isn't done. Place chicken breast in the bottom of a pot. Cover with water so chicken is completely submerged. Add salt, pepper and any spices as desired to the water. Cook chicken on high until boiling. Once boiling, reduce heat to low-medium and cover. Cook for 15 minutes or until chicken is cooked through. Strain chicken and shred with two forks. When the squash has about 10 minutes left on the timer, on medium heat, add 1/2 tbsp extra virgin olive oil to a medium sauce pan. Brown the minced garlic and chopped onion in the pan. Once the onion goes slightly translucent, add the 2 slices of chopped, ready-made bacon. When the bacon has been heated through, add the milk, cornstarch (or xanthan gum) and caesar dressing to the pan. Stir thoroughly. Once bubbling, reduce the heat to medium-low. 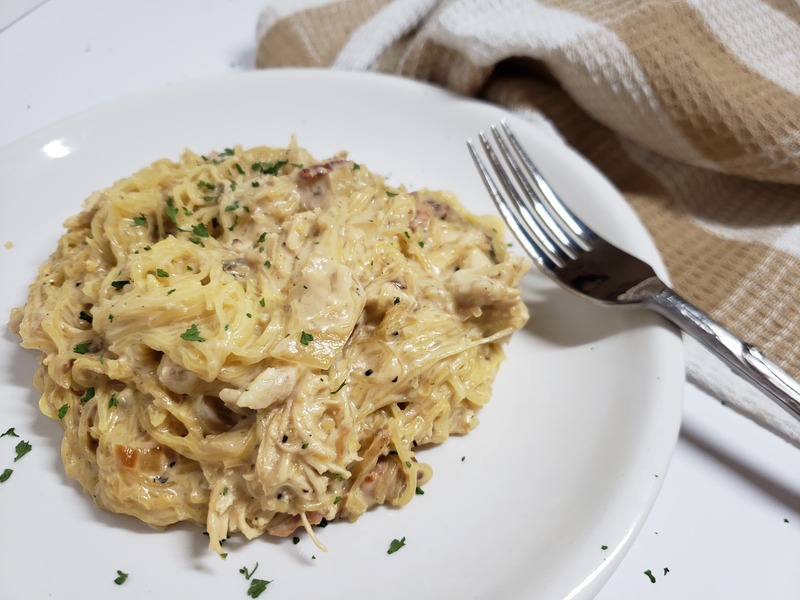 Once the sauce has thickened, add the shredded chicken, parmesan and the cooked spaghetti squash noodles. Stir until pasta and chicken are well coated. 7 WW Freestyle Smartpoints | 220 Calories, Carbs 10.2g, Fat 15.1g, Protein 12.4g per serving. If using regular bacon, cook according to package instructions.